A lot has happened since the end of January if you are a Toronto Maple Leafs fan. Chief among them was the signing of Auston Matthews to a five-year extension. However, right up there was the trade for star defenseman Jake Muzzin from the Los Angeles Kings. It didn’t take long for Muzzin to win over teammates and fans with his solid play. He seems to be a keeper. Both these events will change the face of the Maple Leafs, both for the remainder of this season and in the foreseeable future. Specifically, when Matthews re-upped with the Maple Leafs, it wasn’t just about him. The ripple effect spread downwards and outwards in ways we both can anticipate now, but also in ways that won’t become manifest until after the season is over. Furthermore, what happens during next summer will impact the future for quite some time. I agree that Marner will re-sign in Toronto. The biggest reason is that he wants to. The second reason is that he’s a fantastic young hockey player and the team knows it. Hence, the Maple Leafs will do what it takes to ensure his signing. That’s Dubas’ modus operandi anyway. Assuming all goes as it should and Marner signs, the Maple Leafs will carry four heavy contracts forward. Those contracts cut a huge slice out of the salary cap pizza. Matthews, Marner and John Tavares will probably all earn more than $10 million for the foreseeable future. William Nylander makes a little less. He’s a $6.96 million cap hit through 2024. It’s a good question: what can the Maple Leafs do? 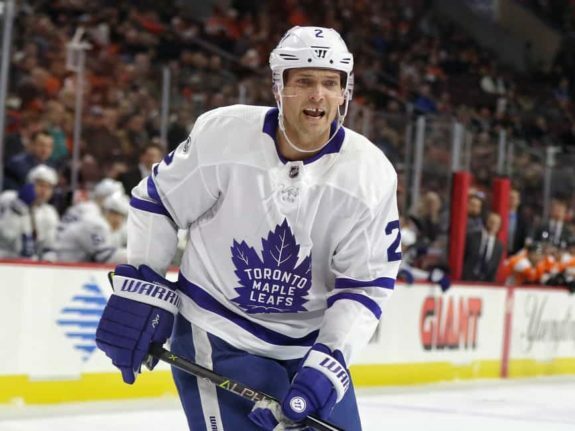 The immediate answer is that it looks as if the team will build a roster of really expensive and really cheap contracts – some of these cheap contracts will be role-players and some will be prospects in the Maple Leafs system. And, that’s one way to shape the salary cap. I have noted in an earlier post that one elite player is far more valuable than two really good players because elite players will lift the ability of role players who play with them, simply because they are so good. Thus, I can see a team made up of elite forwards and skilled, but cheap forwards who play with them. In terms of the Maple Leafs, although he’s recently been injured, Tyler Ennis (and his $650,000 salary) immediately comes to mind. Par Lindholm ($975,000) takes up little salary cap space on the roster. Current fourth-line center Frederik Gauthier ($675,000) and winger Trevor Moore ($775,000) will become regulars next season both because they have cheap contracts and are projecting upwards as quality players. I don’t see any other way. From where I sit, the Maple Leafs signing such expensive contracts won’t make cheap, role players more important. But, what players will leave? That’s where the Maple Leafs defense becomes part of the equation. I believe Muzzin’s signing changes the shape of the defense. I am already on record saying that Jake Gardiner will be gone next season, and might even be traded this season. That moves leaves cap space, especially if Gardiner is traded for prospects. I’m thinking Igor Ozhiganov (RFA) and Nikita Zaitsev ($4.5 million cap hit through 2024) will be gone as well. Although some Maple Leaf fans defend Ozhiganov, I’m just not seeing that his value to the Maple Leafs is great enough to keep him. I think the Maple Leafs can find cheaper help, probably within their own system. Ron Hainsey becomes an unrestricted free agent at the end of the season, and he might just become a special case. I like Hainsey and think his leadership, hockey IQ and experience should be valued despite his age and lack of speed. Although he’s an American citizen, he thinks of Toronto as home and has moved his family there full-time. That’s a deal for the Maple Leafs and, again, a Dubas MO. Although Dubas typically signs younger players, he might make an exception for the 38-year-old Hainsey. I like keeping Hainsey around because I can see him as a potential mentor for the move I believe Maple Leafs management has in mind. 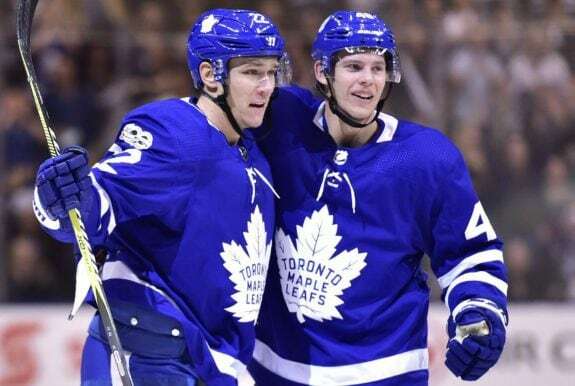 I think they see a reshaped rear guard led by Morgan Rielly, Travis Dermott and Muzzin with a group of young defensemen already in the system moving up to the Maple Leafs next season. This group could include any or all four of 19-year-old Timothy Liljegren, 18-year-old Rasmus Sandin, 25-year-old Calle Rosen and 27-year-old Justin Holl. I’m sure the Maple Leafs are talking to Toronto Marlies coaches about whether they believe any or all these players are ready to move up next season. Related: How Do the RFA Rules Impact Marner & Matthews? Actually, I think the Muzzin trade is more of a seismic shift than it first appeared. I’m also thinking it’s possible that next season’s Maple Leaf defense will become both better and cheaper. And, were that the case, it would offer a little balance in the cap space. Some of the Maple Leafs’ current defense will likely be gone. That’s why I see Zaitsev leaving; although he’s a right-handed shot, he isn’t worth the $31.5-million contract Lou Lamoriello signed him to. Furthermore, that he was Lamoriello’s signee is another reason Dubas might let him go. He isn’t Dubas’ guy. Certainly, there’s a market for Zaitsev. He’s only 27 and has played on the top-four. I am thinking a general manager somewhere would trade a prospect or two for him (cheap contracts), even though his scoring seems to Maple Leaf fans to be declining. There’s a chance Dubas would have to carry some of his salary, but I don’t think Zaitsev will stay. He, like Gardiner, has nights where he simply makes mistakes in his own end – something Maple Leafs fans boo loudly. Now that Muzzin is eating up minutes on the blue line, and doing it every night as part of his normal skillset, there’s every reason to reshape the Maple Leafs defense next season. I am thinking Marner will sign, and then the fun starts.